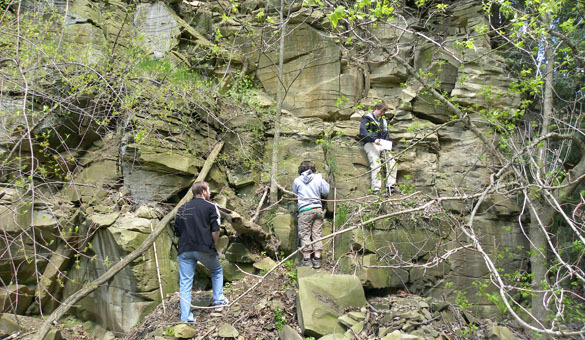 Wooster Geologists » Blog Archive » If it’s spring in Ohio, it’s time for fieldwork! If it’s spring in Ohio, it’s time for fieldwork! 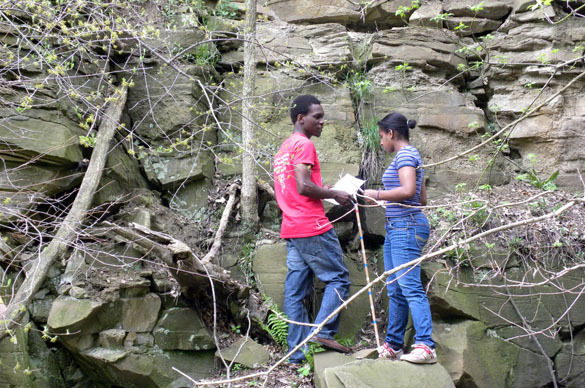 WOOSTER, OHIO–My geology colleagues have already been braving the weather to get their students into the field after the long winter. I like to wait until the end of April when it’s all sunshine and flowers. This week the Sedimentology & Stratigraphy class started its fieldwork with a visit to the Logan Formation exposed in an overgrown quarry an easy walk from campus. The Tuesday section experienced a bit of rain near the end of their work, but today’s section had a glorious day (much like last year at this time and place). 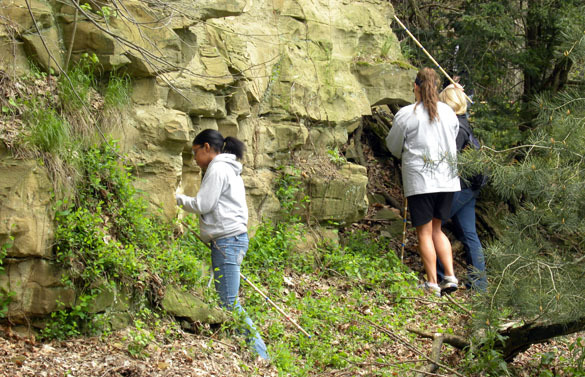 In the image above we see Whitney, Jenn and Melissa describing and measuring the sandstones and conglomerates of the Logan with their fancy Jacob Staffs. Kevin, Anna and Genevieve arrayed on the outcrop. Oscar and Marytha conferring on the composition of the granules in the conglomerate. The conglomerate in the midst of the very fine sandstones of the Logan Formation is the most distinctive unit. 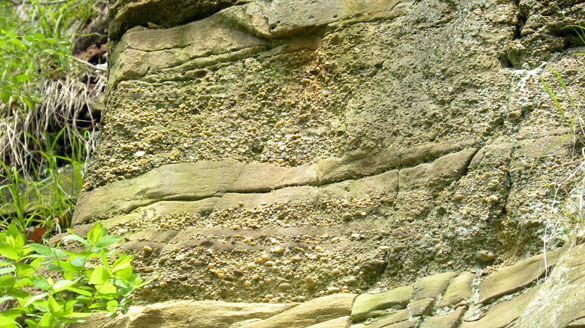 The conglomerate has a sharp lower base and shows graded bedding. Our little afternoon field trip is practice for this weekend’s class expedition to the Mississippian-Pennsylvanian boundary sections in Jackson County, southern Ohio. Hope we have the same kind of weather! A department secret, Stephanie! I’ll tell you tomorrow in class. 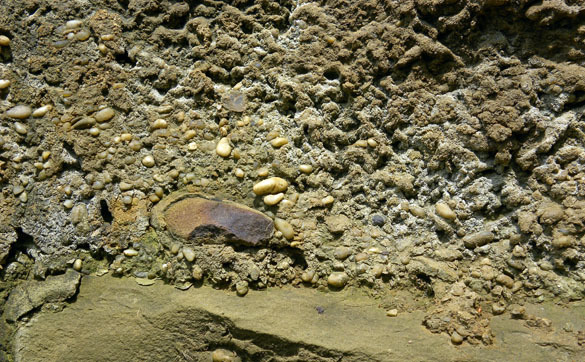 Now read about Wooster’s Fossil of the Week!